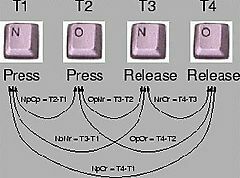 Keystroke Dynamics are the behavioral study of how individual humans type on a keyboard, considering factors such as Flight Time (the time it takes to move from one key to another) and Dwell time (the time a person spends on any given key). The history of keystroke as a field of study dates back to early days of the telegraph, where operators learned the “voices” of other operators as they transmitted messages. During World War II, as part of the cryptanalysis of the British, female code breakers learned the “voices” of telegraph transmitters in the German military. This allowed the Allies to point when transmissions were highly important or likely falsified information. The identification mark, an individual rhythmic pattern to transmitting signals known as the “fist of the sender” became the cornerstone for the study of Keystroke Dynamics. The basis for testing or observing one’s pattern for typing is the repetition of typing so that differences can be noted and patterns observed between words. Today, a template is made consisting of the user typing a series of words over several sessions to break up the time. Forced typing over long periods of time can induce fatigue, stress, and other factors, such as simple typing mistakes, which may inhibit the template’s accuracy. Once proper calibrated, the template will be easily able to distinguish whether the acceptable user is typing or not by comparing the flight and dwell times to those set on the template. The failure of ease in regards to using this system is what inhibits its uses from the public arena. Setting up a series of accepted users is time consuming and based on the studies of one particular study, may be hard to duplicate by that user than by that of another user. Also, the failure of the system to easily identify new acceptable user while in place limits its use. Although developments are being made to prepare the system for such intelligence, it has not yet been incorporated. One of the most likely possible uses for Keystroke Dynamics in the business and information world today would be for user identification purposes. By having the specific user calibrated to typing a specific phrase or password, the analytical software would be able to decipher whether or not the user is the allowed source based upon hesitation and rapidity of the stroke. Thus simply typing the password or pasting it within the appropriate filed would not work because the flight time and dwell times would not match. This would eliminate security threats to an information system even if the actual text or character combination was revealed to an outside source. Additionally, this software could be used to distinguish one person from another in signal based communications, such as typing or telegraphing, where the user is manually inputting the signals according to their own rhythmic patterns. Although not able to identify new users, the software can compare input signals to established templates and determine whether or not the desired user is the one transmitting the signal.